Power Pet Automatic Electronic Dog Cat Doors, ON SALE NOW! WORLD'S ONLY FULLY AUTOMATIC, ELECTRONIC PET DOORS! "My pet just LOVES his Power Pet Door." Pets do love having their own, pet controlled door, a door they don't have to push open. Pet owners love the Power Pet Door too because when compared to a conventional flap type doggy door Power Pet Doors offer you all these advantages. Relieve You From Doggie Doorman Duty! Featured on HGTV and many other news and information shows, acclaimed by experts and thousands of customer reviews, The Power Pet Door is one of the most useful inventions for pets and for the people they own. Power Pet Doors are motorized to operate like a power car window only much faster. 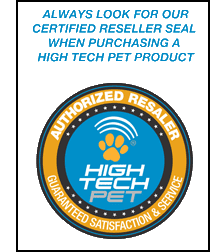 The pet controlled, directional ultrasonic pet collar lets your four-legged friends come and go safely and securely while completely freeing you of doggie doorman duty. Dog training is easy with a power pet electric doggie door. Most dogs learn to use their Power Pet Door with no training at all. 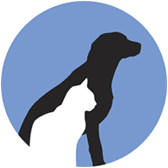 Others may take a few minutes, but virtually all dogs and cats learn to use their automatic dog door quickly and easily with a few simple training steps. Got uninvited guests like raccoons? Power Pet Doors are guaranteed to keep out that clever raccoon as well as other animals, your pet�s neighborhood buddies and even would-be human intruders. DIRECTIONAL ULTRASONIC SENSING: Opens only when your pet is on direct approach, not when just wandering by, sitting or sleeping next to the door. 4-WAY ACCESS CONTROL: In Only, Out Only, In and Out, Closed and Locked. METAL DEAD BOLT LOCK: Impossible to force open. Only the pet collar or secure manual button can open a Power Pet Door. INTRINSICALLY SAFE CLOSURE: The Power Pet Door is not closed by the motor. It uses a completely safe, break-assisted gravity closing system that lowers the door panel smoothly and safely. AUTOMATIC SAFETY RETRACT: The door panel automatically stops and retracts if it senses an obstruction during closure. INDIVIDUAL RANGE CONTROLS: You can adjust the outside distance and inside distance independently. It's usually more convenient to give your pet more opening distance when approaching from the outside than from the inside. BEST WIND AND WEATHER INSULATION OF ANY PET DOOR: Power Pet Doors are hermetically sealed and completely wind proof giving you the best insulation of any dog door or cat door made. WHAT ABOUT OTHER BRANDS THAT CLAIM TO BE AUTOMATIC? Other electronic pet doors clam to be automatic but no other brand or model comes close to the technology, features and convenience of a genuine Power Pet Door. Electronic Doggy doors including as Staywell Magnetic Locking Doors, Petsafe Passport and Smart door are not motorized. They use a hard swinging flap that just unlocks in the presence of an RF, magnetic or RFID collar tag. Non-motorized, so-called electronic pet doors still require your pet to push open the hard flap, something many dogs and cats don't like to do. Even still there are many mechanical problems associated with these would-be automatic pet doors. There are a couple of other motorized electronic doggie doors including the Solo door, sold by Moore Pet Doors, which uses older technology which can be opened by any magnet, leaving your home vulnerable to any thief with a magnet. Solo doors are thick, bulky and require difficult, time consuming, between-the-studs installation. By contrast our extremely slim, Power Pet Doors are less than two inches thick and install as easily as the easiest conventional pet door. Both door and wall installations surface mount in front of a small opening for quick, easy installation. You can even install them in most French doors with a little difficulty. The magnetic sensing systems as used by the Solo doggy doors are short-range, inaccurate and highly sensitive to electric appliances. They may suddenly start opening and closing in response to your dishwasher or washing machine. Power Pet electronic pet doors use a patented directional ultrasonic sensing system that responds to one thing only, the tiny, water-resistant collar. Another key concern is that the Solo automatic pet door is not UL approved for safe electrical manufacture. We would never recommend putting an electrical appliance in your home that is not UL approved. We spotted another so-called automatic dog door on the internet recently which appears to be a knock-off copy of the mechanics used by an older, discontinued Power Pet model. The Plexidor electric doggy door uses an extruded aluminum frame which is not as strong or stable as the composite ABS polymer used on the Power Pet Door. It may seem like metal should be stronger than plastic however, with a highly tooled injection mold it is possible to engineer a structure that is far stronger, more rigid, impact resistant and temperature stable than a hand welded aluminum extrusion. Power Pet Doors are less unlikely to jam in extremely cold or hot weather. Additionally the RFID system used by the Plexidor requires a large collar key suitable only for large dogs. The Plexidor does not have directional sensing, safety retract, 4-Way Access or individual range controls. �And we can't understand why such an inferior electronic pet door sells for over $1,200.00! No competing model, not Staywell, Petsafe, Solo or Plexidor offers you the highly engineered sophistication of a genuine Power Pet Door, neither will you find the advanced features of directional sensing, Auto Safety Retract, 4-Way Access Control, Individual Range Control, Automatic Safety Retract, Metal Dead Bold Locking and the many other ingenious and useful features found only on genuine POWER PET automatic pet doors. No other pet door, so-called electronic, automatic, or conventional flap type, offers you the performance, convenience, energy efficiency, security and reliability of a Power Pet Door. That's why Power Pet outsells all other electronic pet doors combined. HOW WELL WILL THE POWER PET DOOR INSULATE YOUR HOME? The Power Pet Door uses a unique, patented panel that is mounted on a wear-resistant sliding seal. No air will pass through the closed panel no matter how strong the wind is blowing. Only Power Pet Doors can make this claim. Conventional pet doors and pet screen doors like Ideal, Dog Mate, Petsafe and Johnson pet doors use a single flap that lets in streams of air. Not even double flap Hale pet doors or the Ideal Ruff Weather doggie door can seal as well as Power Pet dog and cat doors. The Power Pet Door is simply the best weather sealed pet door made and will not leak a single puff of air even in hurricane force winds. WHAT ABOUT A PATIO DOOR? Only Power Pet offers you a ready-made, easy to install patio pet door insert that comes pre-assembled with a Power Pet Door already installed. The Power Pet Patio Panel drops right into your sliding glass patio door and takes only minutes to install. Power Pet Patio Panels are made from a heavy-duty aluminum frame that is nearly twice as thick and 8 times more rigid than most conventional patio pet door inserts. Power Pet inserts are available with double pane e-glass that is energy efficient and will keep your home well insulated while saving on energy bills. WHAT COMES IN THE BOX WHEN I PURCHASE A POWER PET DOOR? Power Pet Door: The world's most amazing pet door. Hardware Mounting Kit: All the screws you need to securely mount your door plus decorative screw covers. Outer Frame: A molded bezel that frames the back opening of your Power Pet Door for quick, easy installation with a professionally finished look. A.C. Wall Adapter: Even the adapter is state-of-the-art. This is the new technology switching power supply that provides lots of power in a small, light-weight unit with extremely cool operation. Extra MS-4 Ultrasonic Collar: This is our new rugged and water resistant pet collar that is perfect from most pets. This collar will work in rain and snow without fail. However, if your dog loves to chase fish, you may wish to upgrade to the MS-5 submersible collar. MS-5 Fully Waterproof, Submersible Collar: For the water loving dog who loves to swim or even scuba dive, our new MS-5 collar is fully waterproof and submersible to a depth of over 10 feet. This collar also has a screw-together case that is extra-rugged. Extra Collar Batteries: The MS-4 and MS-5 operate on a custom, long-life lithium battery, model B-3V1A. This battery normally operates the collar for 3 months or more. Available in single pack, 2 pack and 6 pack quantities. Rechargeable Pet Door Battery: Our model B12V-1.3 is a rechargeable battery designed to operate your Power Pet Door without A.C. wall power. When purchased without the charger it may be used as a back-up battery to operate your Power Pet Door in case of a household power outage. When power is restored, the battery will recharge through the Power Pet Door's smart power circuitry. Battery Charger Kit: The CRG-12-2 kit includes a charger and 2 rechargeable batteries. This kit allows you to conveniently operate your Power Pet Door without ever plugging it into the wall. Use one battery to power your door and keep the other in the charger. When the door battery runs low (after about 1000 cycles) just swap. Wall Installation Tunnel: A must have for quick, easy installation of your Power Pet Door in any wall. The installation tunnel instantly frames the wall opening saving lots of time and money on wall installation. Purchase accessories separately or as options when ordering your Power Pet Door. HOW DOES THE POWER PET DOOR WORK WITH THE P.A.W.S. PRODUCTS? Power Pet Doors are part of our PAW (Pet Automated World) family of compatible products which work together. designed to keep pets off couches and beds out of selected rooms and away from �OFF LIMITS� areas. 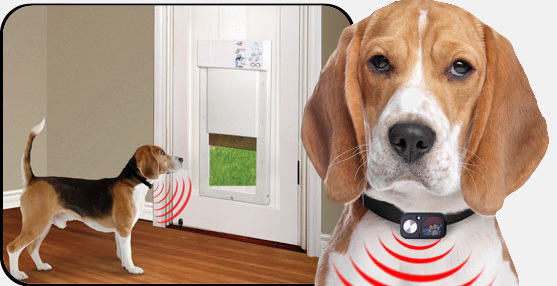 The Power Pet Door collar will operate as many of these ultrasonic fences as you like while allowing your pet access to the amazing Power Pet Door. 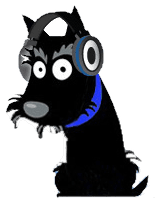 You can configure a custom electronic pet care system that will keep your dog contained in the yard, out of flower beds, off the couch and away from the trash can while giving him access to his personal Power Pet Door, all with a single collar. Only Power Pet fully automatic electronic dog and cat doors give you the level of professional engineering, safety and security for doors, walls patio doors and French doors and allow you to integrate with other electronic pet supplies for a complete automated pet care system. All this while adding a beautiful show piece to your home that will give you and your pet something to howl about!